Back to our baby times, our moms wrapped our bottoms on piece of squared white cotton napkin or cloth diaper. During that time, napkins were secured by big safety pins. Today, napkin fasteners (with three-side hooks) are highly recommended and sooner substituting the safety pins. Napkin fastener looks much safer but the con is that it can't hold the napkin as secured as the safety pin. In order to minimise the usage of disposable diapers, I'm still hoping to get a better alternative. Commonly pocket diapers comes with 2 types of closures: (1) Hook & Loop (Velcro) ; (2) Snap (buttons). I chose one each for my Sampler Pack. Based on my experience, I found out my baby outgrow in the Snap closure faster than Hook&Loop (H&L). 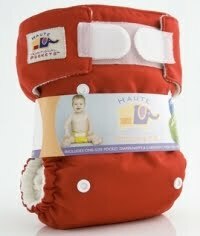 (see picture above - Baby @ 10 mths old wore Blueberry) H&L (size L) can hold up my baby well from 4 mths to 1 year old. Diaper changing is as easy as 123 at home - snap on or snap out. Also, you are not only saving up a lot of money but you are saving the Earth. It's worth the investment. It's happy to know that many new moms are using pocket cloth diapers. Regardless the premier Minky type or the budget PUL type, they work same for the functions (easy-wear, save money & environmental-friendly). Currently I stock in some HAUTE's pocket diapers and sell them at attractive price, RM 30 per piece... to support your baby goes GREEN.